I missed posting this earlier in the week. It ends tonight. 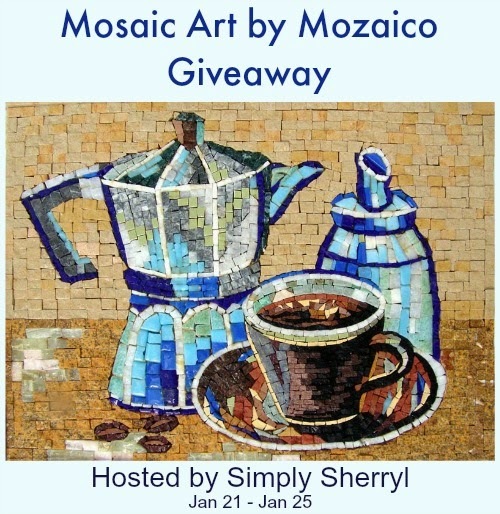 Enter to win some mosaic art. Giveaway is for US residents only. And, as stated, ends 1/25. Good luck. Mozaico carries a large line of custom "living mosaics" that shine through in their mosaic pieces. Designs are available from nature, figures, animals & sea life. They specialize in custom work but have an amazing product line that you can tap into for sooner delivery. From Mosaic borders to kitchen murals, Mozaico can meet your custom design needs. This tea kettle and cups mosaic tiles shines with the beautiful shades of blue against shades of brown. The detail in the objects is wonderful, making it look as though they are lifelike. It is a quaint example of artwork that will fit into nearly any kitchen. The hand cut tiles are something that is not all that common in most artwork, so you will have a piece that is very unique to hang up and admire. Sherryl from Simply Sherryl received products from this sponsor to facilitate her review, no other compensation was received. All participating blogs are not responsible for prize fulfillment. This giveaway is in no way associated with social media sites including Facebook, Twitter and Pinterest. I have some decorative grapes in a decorative bowl in my kitchen. I need to really upgrade my decor, its all so old. My favorite decoration is a handmade wooden piece that says "Families Are Forever." I was able to choose how many "charms" I wanted on it and we have one for each family member. It's personalized with everyone's name. I purchased it from an artist at Silver Dollar City. This is beautiful. I've neever seen one like this. Thanks for the chance and the giveaway. None - I need one - I have no decorations in my kitchen!